If there’s one kind of romance in a science fiction romance that’s an automatic read for me, it’s the type involving a couple with a military rank differential. That’s a high falutin’ way of saying I lurv me a romance where one of the protagonists is a military officer who outranks his/her lover. I adore this set up. I’ve loved it for years, although there aren’t tons of stories that really focus on the dynamic in a significant way. Usually I’ve found it’s a subplot of the overall romance. Not that I’m complaining or anything! One, it’s almost always a forbidden love scenario given the inevitable restrictions against fraternization. Two, the difference in rank creates a power imbalance, and there are all sorts of ways authors/filmmakers can exploit it for conflict. I love watching a mini rebellion unfold as the lower ranking half of the couple chafes against the (perceived) restrictive orders of his/her superior. 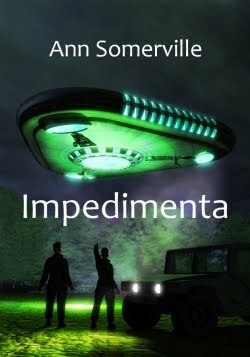 Three, because they are military personnel, the couple frequently faces some kind of external danger. Nothing wrenches my gut more than a captain having to send his lover into the dangers of combat, or having to leave him or her behind (possibly risking his lover’s very life) in the interest of saving the lives of many. Or experiencing the anguished emotions of the one left behind as the other races off to battle the villain. A sequel to Interstitial. North and Seb are still fumbling towards happiness, but the baggage they both carry is holding them back. Still, a six month mission on a quiet backwater of a planet could be the making of them…but then Jati has to go and say the fatal words: ‘milk run’. She should know by now that nothing is ever that easy – and space is full of surprises. I won’t reveal any spoilers, so suffice it to say that Seb and North are both involved in a dangerous adventure that tests their love and risks their lives. I didn’t know the scenes were coming, so I was excited when they appeared. “Here is one of the reasons why I love science fiction romance,” I thought, because this relationship dynamic is one I’m happy to revisit again and again and again. I also love the fact that Seb is an older, more mature hero. The age difference created another level of tension, conflict and angst. North is a hothead, basically, so conflict is guaranteed from the outset. Sandra McDonald’s THE OUTBACK STARS also included this type of relationship. The heroine, Lt. Jodenny Scott, outranks Sergeant Terry Myell. Nathalie Gray’s METAL REIGN features a starship captain, Frankie Beaumont, who falls in love with the ship’s cook, John O’Shaughnessy. 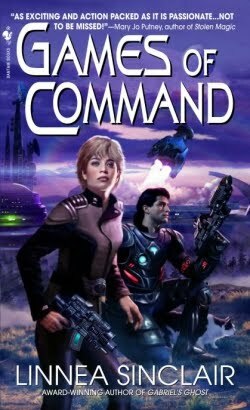 And, of course, there’s GAMES OF COMMAND by Linnea Sinclair, wherein cyborg hero Admiral Branden Kel-paten is Captain Tasha “Sass” Sebastian’s superior officer. I’m interested in any kind of combination, and I think military couples in science fiction romance showcases one of the best intersections of science fictional and romantic elements. No wonder authors like writing these stories, and future tales are full of potential. Do you enjoy reading about military couples? If so, please share the titles of your favorite stories. If not, what type of science fiction romance couple interests you the most?